Home > Departments > Faculty > Amy Richter Ph.D. Professor Richter specializes in nineteenth and twentieth century American and cultural history, with an emphasis on women’s and urban history. Her teaching repertoire includes the history of American Women, U.S. urban history from the colonial era to the twenty-first century, Gender and the American City, and American Consumer Culture. She is also the author of Home on the Rails: Women, the Railroad, and the Rise of Public Domesticity (2005) and At Home in Nineteenth-Century America: A Documentary History (2015). 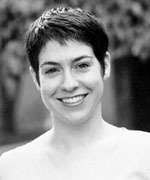 Her current research looks at marriage and the consumer marketplace at the turn of the twentieth century. Home on the Rails: Women, the Railroad, and the Rise of Public Domesticity, Gender & American Culture Series (Chapel Hill: University of North Carolina Press, 2005). "At Home Aboard: The American Railroad and the Changing Ideal of Public Domesticity," in Gender and Landscape: Renegotiating the Moral Landscape, Lorraine Dowler, ed. (New York: Routledge, 2005). "A Few Great Men: Or How to Get Things Done in New York City," Journal of Urban History, Vol. 30, No. 2 (January 2004), 266-274.